On this date in 1803, Irish nationalist Robert Emmet was hanged and posthumously beheaded, a day after his trial for treason against England. The well-to-do scion of a Protestant family, Robert Emmet followed his older brother into the Republican ferment of the time and led an unavailing uprising in Dublin on July 23, 1803. Emmet won his great laurels in the annals of Irish Republicanism with a stirring “Speech from the Dock” addressed to the courtroom the day before he died. Or better to say that it was addressed in a courtroom, for knowing that his death sentence was a foregone conclusion, the real audience was posterity and a wider world. Emmet found that audience with one of the great orations of the 19th century. This clip is a truncated version of a longer speech not set to paper by Emmet, so no single definitive version exists. 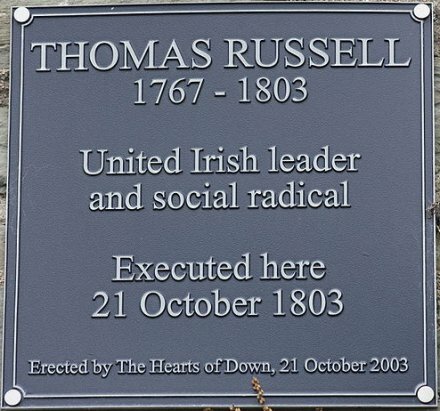 Versions can be found at this Irish history site, and at SinnFein.ie. I have but one request to ask at my departure from this world — it is the charity of its silence! Let no man write my epitaph: for as no man who knows my motives dare now vindicate them. let not prejudice or ignorance asperse them. Let them and me repose in obscurity and peace, and my tomb remain uninscribed, until other times, and other men, can do justice to my character; when my country takes her place among the nations of the earth, then, and not till then, let my epitaph be written. I have done. But that sundered love between Emmet and Sarah Curran — who broken-heartedly accepted another proposal and moved to Sicily — was at least as stirring to the Romantic imagination. 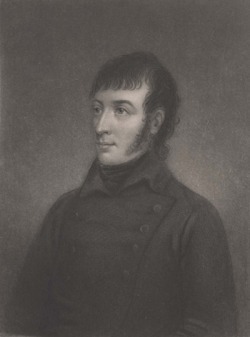 Washington Irving dedicated a short story to the lost romance; Emmet’s friend Thomas Moore made Curran the subject of a poem (beware: link opens an auto-playing audio file). 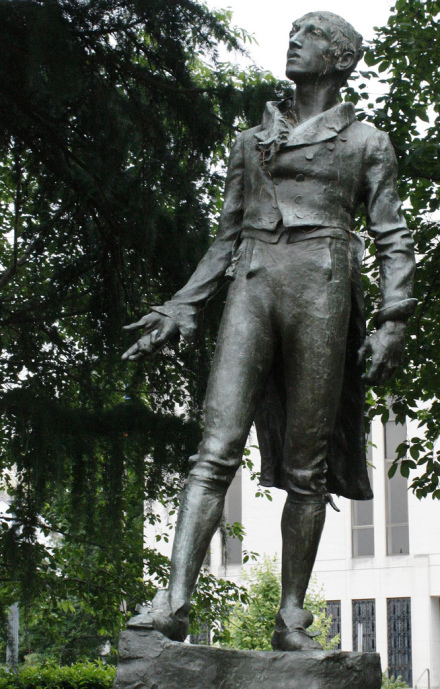 Anti-British terrorist Robert Emmet has a statue on Washington, D.C.’s Massachusetts Ave, and probably an entry on the no-fly list. From her ow lov’d island of sorrow.